Piling work for the 17-storey Farhad Azizi Residence (right) has been completed. Prestige Constructions has been awarded a Dh200-million ($54.4 million) contract by Azizi Developments for the construction of ‘Farhad Azizi Residence’ project within Dubai Healthcare City (DHCC). Scheduled for completion in 2020, the project was launched by Azizi Developments in DHCC following the strong demand for Azizi Aliyah Residences, the company’s first premium residential project in the Dubai wellness neighbourhood. 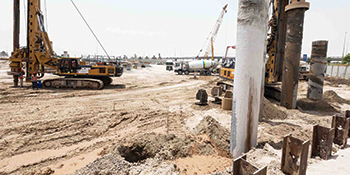 Piling work for the 17-storey Farhad Azizi Residence, which has a basement and two podium levels, has already been completed and Prestige Constructions will soon start work on the residential development that will feature 634 premium units. Set in a total construction area of 728,715 sq ft, Farhad Azizi Residence boasts 396 studios, 218 one- and 20 two-bedroom apartments. Prestige Constructions CEO Nur Alam Choudhary says: “Azizi Developments is setting industry benchmarks with their goodwill and business practices. We are delighted to partner with the company again and are thankful to them for the trust and confidence bestowed in us. Prestige Constructions has a strong presence in Dubai, Sharjah and Ajman.